Habayit Hayehudi (Jewish Home) is gaining popularity among olim from France, who are finding "a home in the Jewish Home". Habayit Hayehudi (Jewish Home) is gaining popularity among olim (new immigrants) from France. On Sunday evening, the party held a special event in Jerusalem for the French Jewish community in Israel. The event was attended by Bayit Yehudi chairman Naftali Bennett, Rabbi Shlomo Aviner of Beit El, and three of the party's candidates for the Knesset: Rabbi Eli Ben-Dahan, former director-general of the rabbinical court system, Orit Strook, chairwoman of the Yesha Human Rights organization, and Yoni Shetbon, an activist in the Jewish Home's youth wing. According to the Director of the Jewish Home's division for French Jews in Israel, Dina Cohen, "The Jewish Home is the only party that represents the values of the French-speaking Jewish community." "It's true that in the past, French-speaking Jews voted for the Likud but in recent years there has been disappointment with the Likud's performance and especially with the Prime Minister who didn't work for this community," Cohen told Arutz Sheva, adding that "today the French-speaking public finds a home in the Jewish Home, which represents its needs and values​​." She added, "There are over a quarter million French speakers that no party has ever considered. It is time that the Jewish Home opens its doors to them, so they will have a political home." Shetbon, who is in the no. 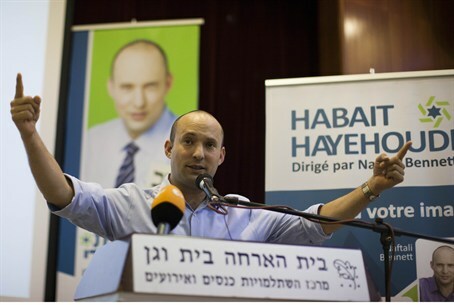 11 spot on the party's Knesset list and whose parents are themselves olim from France, told Arutz Sheva that he believes the Jewish Home is a perfect fit for French-speaking Israelis. "There is a connection between the French Jewish community and the Jewish Home," he said. "The French olim are very traditional, Jewish and Zionist, and so their natural home is the Jewish Home party."